The Needlework Development Scheme (NDS) was established in 1934 to encourage embroidery and to raise the standard of design in Britain. Organised by four Scottish art schools, Aberdeen, Dundee, Edinburgh and Glasgow, its collection of foreign and British embroidery was available to domestic science and training colleges, women's institutions and schools, as well as art schools. 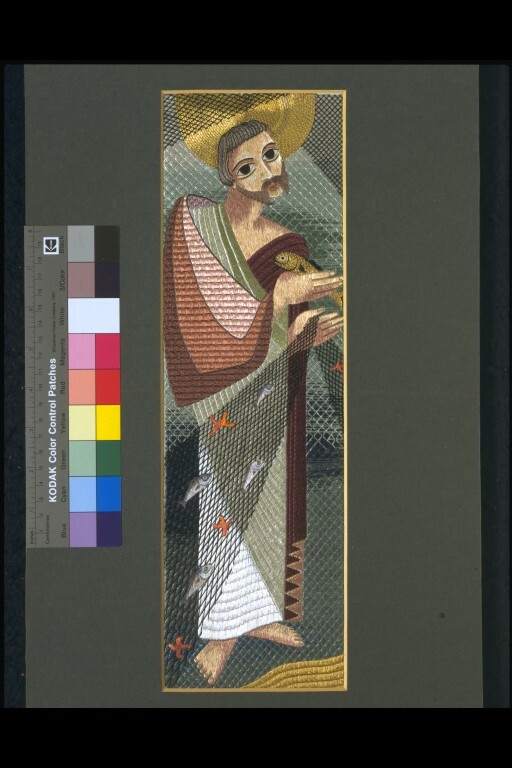 By 1939, the Scheme had acquired some 900 embroideries but the outbreak of WWII closed the Scheme and the collection was retained by the four original art schools. Glasgow School of Art was instrumental in re-starting the scheme late in 1944 and the NDS was gradually expanded to encompass other art schools in the United Kingdom where embroidery was caught. The NDS was disbanded in 1961 when funding was withdrawn, although it was recognised that the Scheme had achieved its aims. Its collection was divided and distributed to various organisations included the Embroiderers Guild, The National Museum of Scotland and the V&A. Beryl Dean trained at the Royal School of Needlework and taught at Eastbourne College of Art. She is best known for her ecclesiastical embroidery. She was awarded an MBE for services to embroidery in 1975. In an interview on 13 December 1996 Beryl Dean, aged 86, said that she had found the gold fabric for this panel in Rouen market. Panel of hand-embroidered linen in silks and gold threads. 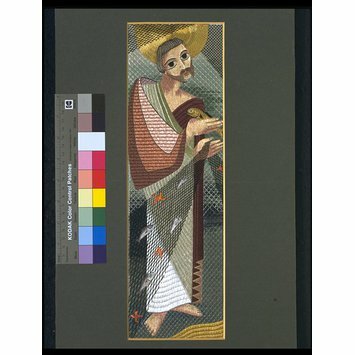 With a figure representing St Peter. The stitches used include a variety of laid work fillings, encroaching satin stitch, split stitch and couching. 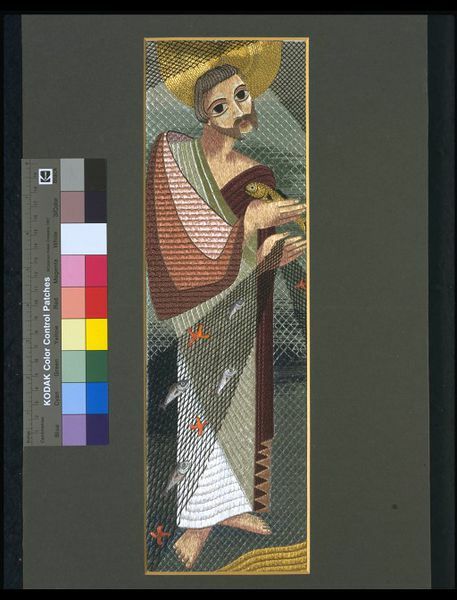 The Needlework Development Scheme had commissioned Beryl Dean to produce work to inspire more innovative ecclesiastical embroidery. They gave her five titles covering types of items and technqiues and she produced samples covering the areas she felt most inspired by. She said that she also did some good items at the time which she did not let the NDS have. Subjects she did work were from the titles 'laidwork' and 'altar linen'. Attribution note: In an interview on 13 December 1996 Beryl Dean, aged 86, said that she had found the gold fabric for this panel in Rouen market.